Members of a Florida community association board may be recalled and removed from office with or without cause by a majority of all voting interests of the association by vote at a meeting or by agreement in writing. 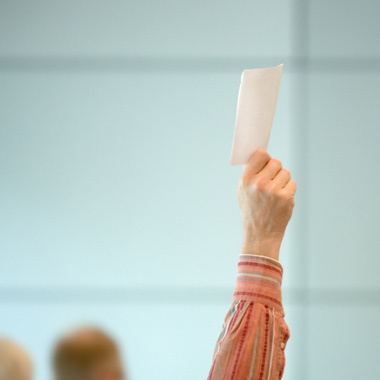 If the recall is to be achieved at a meeting, a minimum of 10 percent of the association’s voting interests must provide for the giving of notice of the meeting. The notice for such meeting must state that the purpose of the meeting is to recall one or more directors, and if a majority or more of the board is subject to recall, the notice shall also state that an election to replace recalled board members will be conducted at the meeting. If less than a majority of the board is recalled, the existing board members may fill the vacancies. If a majority or more of the existing board is recalled, an election shall be conducted at the meeting to fill the vacancies resulting from the recall. Within five days of the adjournment of the members meeting to recall one or more of the directors, the board shall properly notice and hold a board meeting to consider whether to certify or reject the recall. If the board certifies the recall, then the recall is effective upon certification. Alternatively, directors may be recalled by written agreement. A sample of the form to be used in a recall by written agreement is available from the Division of Florida Condominiums, Timeshares, and Mobile Homes (“Division”) by clicking here. In this form of recall, the name of the directors sought to be recalled must be listed and the form must provide spaces by the name of each board member sought to be recalled so that the person executing the agreement may indicate whether the director should be recalled or retained. If a majority or more of the existing board members are to be recalled, the agreement shall list at least as many eligible persons who are willing to be candidates for replacement board members as there are board members subject to recall, and it should contain additional spaces for write-in votes. Further, there must be a signature line for the person executing the agreement to affirm he/she is authorized to cast the vote for his unit. The original agreement must be served on the board by certified mail or personal service. As with recall efforts conducted at a meeting, the board must call a meeting within five business days after service of the agreements and either certify the recall agreements. In the event the board fails to certify the recall (whether a recall by written agreement or by vote at a meeting), they must file a petition for arbitration with the Division within five business days of adjournment of the board meeting. If the board fails to duly hold a meeting to vote on whether to certify or reject the recall, then the recall shall be deemed effective. The foregoing serves as a brief outline of the recall procedures for removal of community association directors in Florida and shall not be exclusively relied upon for recall efforts. While the owners seeking to remove a director must always consult with the governing documents for the association in case there may be additional requirements or procedures for the removal of a member of the community’s board, Florida law provides the minimum requirements that must be adhered to for the removal of such director. Although there have been little changes to such procedures for many years, an increased understanding of community association laws and procedures seems to have led to greater use of the recall process to remove directors deemed to be undesirable. Fortunately, careful adherence to the legal procedures will provide successful results for the parties seeking the recall. However, just one seemingly insignificant failure to follow such procedures may render an otherwise well supported recall effort ineffective. In light of this, owners seeking to commence recall efforts are encouraged to seek the advice of counsel or the representatives from the Division in order to ensure a successful outcome to their recall effort.